There’s a certain amount of bracing one does before reading books about boys in the jungles of India and Africa written in the early 1900s by white authors. It was the height of the British Empire and feelings of racial and cultural superiority ran rampant; many viewed the native inhabitants of far-flung colonies as barbarous and backward. As I began The Jungle Books by Rudyard Kipling, published in 1894, I expected outdated and offensive language and uncomfortable representations of the local people. Other than a cursory glance at Just So Stories I’d never read him before and my preconceived notions stem from my tendency to conflate him with Joseph Conrad, an author of dubious reputation. Reading The Jungle Books was less about coming to a supposedly enjoyable classic than embarking on a sociological experiment. The Jungle Books, as I found out, is not a novel but rather a collection of short stories, the bulk of which make up the the well-known tale of Mowgli, the Indian boy orphaned in the jungle and raised among the animals. The other stories, dispersed between, are unrelated sketches of other animal stories set in various locations. After reading The Jungle Books all the way through, I found the ancillary stories a distraction, and of mixed quality. Some were cute while others are entirely skippable. However, going back to my reason for reading the book in the first place, I was surprised to find that, with the exception of one mention of “Mohammedans,” a derogatory term for Muslims not often used today, there was very little, if anything, that bothered me. It could be that I missed something but I believe I gave it a good, close read. Instead, it was Tarzan of the Apes, first published in 1912, another story about a boy raised by animals in the jungle, that made me cringe. Unlike The Jungle Books, which can be found in the fiction and literature section, Tarzan of the Apes, written by Edgar Rice Burroughs, is found in science fiction. Because of this connection with genre I expected Tarzan to be the more enlightened of the two. With few exceptions, sci-fi tends to be progressive, often questioning society’s norms and pushing the boundaries of cultural understanding through use of metaphor. For me, science fiction has always seemed forward-thinking. Like Mowgli in The Jungle Books, Tarzan is orphaned at an early age. His father, John Clayton, an English nobleman is commissioned to investigate conditions in a British West Coast African colony. He brings with him his pregnant wife, Lady Alice, but soon there is trouble on the ship. Officers are murdered and the couple is left ashore with their belongings — marooned in Africa. John builds a small fortified cabin and Lady Alice gives birth to a boy. A year later she becomes ill and passes away in the night; shortly after, John meets his death at the hands of a king ape. The baby, thereafter known as Tarzan, is adopted by the king ape’s mate and treated as her child. He grows up with no memory of his birth parents. The story continues, following Tarzan through his adventures in the jungle — biologically a man but part ape, strong and agile, by nurture. The problematic part of the story comes when Tarzan spies other humans and stumbles into a nearby tribal village a number of miles away. They are native Africans and portrayed as the typical savages you see in old movies and cartoons: naked children and adults in dried grass skirts with brass and copper jewelry and large nose rings. They are superstitious and practice torture and cannibalism. The scenes were difficult to digest and I found it hard not to wince. Aside from the natives who are underdeveloped flat characters, Esmeralda, an African-American, is the only other black character that appears in the novel. Weighing in at 280 pounds, she is nonetheless a trembling ‘frightened child’ (page 131) rolling her eyes from side to side before fainting in the face of the ‘terrifical’ (page 177) circumstances and ‘carnivable’ (page 242) animals roaming the ‘jumble’ (page 243). Her character is a convention, her malapropisms a joke. She functions as nothing more than a stereotype of black superstitious fear for purposes of comic relief. . . . Blacks are treated mostly badly in this novel as they were during the period in which it was written. Unfortunately, for the liberal-minded, the story as a whole is interesting and highly readable, more so than Kipling’s comparable novel. While The Jungle Books suffers from its disjointed nature, the main story of Mowgli continually disrupted, Tarzan of the Apes is a novel in the proper sense — coherent and linear. Reading ourselves into Tarzan’s adventure is not, however, without problems. From a twenty-first-century perspective, the book doesn’t always feel like an escape, because it can so easily be arraigned as an unfortunate manifestation of the period’s assumptions about race, class, and gender. If one were in a prosecutorial mood, it might be tempting to cast off Tarzan of the Apes and simply catalogue it as politically incorrect for its social and cultural values, but to reject the book on such grounds would provide, in effect, a rationale for editing out many of the writers contemporary to Burroughs, including Hemingway and Fitzgerald. . . . A more productive approach is to recognize that such attitudes were pervasive in the culture contemporary to Burroughs, a strategy that doesn’t excuse or mitigate them but that attempts to create a better understanding of the novel. The amount of forgiveness given to books and authors varies based on the offender and the offended. As someone who loves philosophy but with a strong aversion when it comes to anti-Semitism, I still haven’t read Heidegger. So, while Tarzan of the Apes, racism aside, is a great book, consider yourself warned. The Jungle Books, on the other hand, skip the stories in between and you’ve got yourself a great story. 312 pages in and i think i know a little more about Descartes. it’s more like i get the essence of descartes’s works right after the renaissance. apparently, the whole “renessaince project” failed and the new bourgeois class freaked out. they lost what little control they had and werent sure how to deal with it. 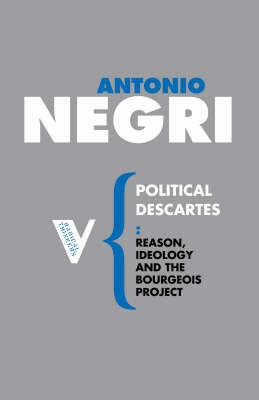 antonio negri, an italian marxist who spent some time in jail*, and the reason why i decided to read the book, talks about how Descartes handled the whole failure. i couldnt tell you coherently exactly how he did handle it but it had something to do with believing in god even though His existence isnt provable and figuring that you cant really know if anything exists besides yourself and you only know that because you’re thinking. i think he was trying to beat the skeptics at their own game. so that’s what i got out of this book. it was a lot to take in and most of it went over my head but it was a fun challenge. i cant imagine this being the best introduction to antonio negri but it’s probably essential if you want to consider yourself a fan.